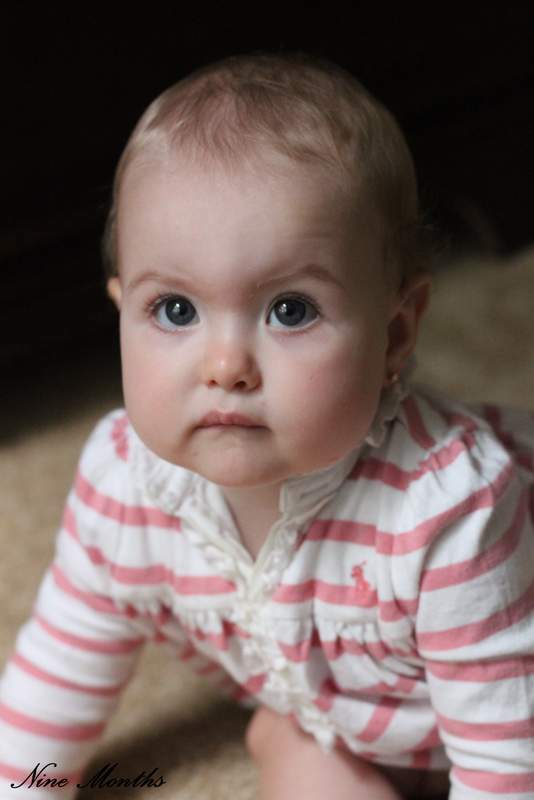 Far More Than Rubies: Happy Nine Months, Sophia! Well, they say better late than never, right? She turns 10 months old in just three short days! The month leading up to when she turned 9 months old is a bit of a blur now. So this won't be a very detailed post. I do remember that she began having stranger anxiety/wanted me only about mid month, which is totally normal for this age. She also started waking up at 5:30 in the morning, which is just too early in my book. So every morning, for almost 3 weeks, Ian would get up, take Sophia downstairs to the office (which was much darker than her room) and put her in her pack n play. I know it sounds really lazy of us, but she would fall right asleep and still be sleeping when we got up at 7! I will tell you this: Sophia is not, and never has been, a great sleeper. Or she just doesn't need as much sleep as Grace. Or me. Or Ian. Or normal humans. I will also say, on the other hand, that it drives me crazy when people tell me that we are "lucky" to have such great sleepers. It's not luck. It was sleepless night after sleepless day of hard work and sleep training. We believe toddlers and infants need a full night of sleep (almost 12 hours or more,) that they should be taking multiple, two hour naps in the day, and that their bedtimes should be hours before ours, in order to have some quality, grown up time together. Stepping off of my podium now. So Sophia isn't the best sleeper but we try to remain flexible with her while still aiming at bettering her sleep habits. She really became a crawler that month, which was amazing to me and annoying to Grace. All day long we would hear "No, no, no, Fia. My toy." And poor Sophia would get whatever she was about to play with/slobber on taken from her. Sophia also got better at taking baths and was moved from her baby bath to the real tub with Grace. On the day that we switched her, (because she kept pulling up,) I slowly backed out of the room to grab my camera, which was just five feet outside of the bathroom. In the two seconds it took to take my eyes off of her, grab my camera, and turn back around, Sophia slipped under the water. Of course I immediately was there scooping her up, but it was so terrifying and an image I will never forget. Her ninth month was much more exciting and filled with firsts! Precious! Those CHEEKS! They go on for days... I love it! I love her! Miss ya'll. Get back on over here, mmmkay? I totally agree with you on the sleep training thing. It's a lot of work and a lot of time sacrificed (Cant tell you how many times we've turned down evening activities or left a party early to make it home by Isaac's 7-7:30pm bedtime. ), BUT I also think babies function best with lots of sleep. Sweet baby girl is growing up! Looks like you guys have been having a wonderful time state side! Totally with ya' on the sleep thing! Georgia has been on one nap since 9 months but she made it VERY clear that she needed the switch but it's usually a 3 hour nap so it's a good one! Today is was 4 hours! woo hoo! Yes, sleep training is hard but it's worth it when it works out!